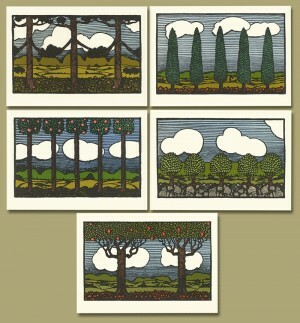 These tree images were designed by Dard Hunter in 1905 for the Roycroft publication of Nature by Ralph Waldo Emerson. The original design incorporated initial capitals for the beginning of each chapter. In our updated version, the trees have been lovingly redrawn and are letterpress printed by hand in six colors. Set of 10 cards with matching off-white envelopes. (2 each of the 5 Trees from "Nature" designs). Cards measure 7" x 5". AND NOW: FREE SHIPPING ON ALL CARD & STATIONERY ITEMS!